There are many forms of soccer that have shaped the development of the global game over the years, and for one Premier Development League alum he is taking full advantage of his unique opportunity. Gabe Silveira, a California native, has featured for two PDL sides in his four-year career in the league, and it was that experience that helped guide him towards beach soccer. The former Burlingame Dragons and San Francisco Glens SC midfielder was only introduced to beach soccer in high school, however, Silveira will be heading to Dubai in Nov. for one of the sport's biggest international competitions. After earning his first call up to the U.S. National Beach Soccer Team in August for the Balaton Cup in Hungary, where Silveira and his team earned the gold medal, he will once again be traveling with the Americans for next month's Intercontinental Cup -- which features eight one of the world's top beach soccer nations. Former PDL midfielder Gabe Silveira spoke with USLPDL.com about his development in PDL, his experience with beach soccer and the feeling of representing the United States at the international level. PDL: What have you enjoyed most about playing in PDL and the culture around the league? Gabe Silveira: Before I played in the PDL, the highest level I had played in was college at Sacramento State. When you play in the PDL, you get a pool of top talent from universities on your team. Throughout my years in the league, I saw a lot of guys make it to the next level. Looking back on those guys who went pro, you could see it in their attitudes and personalities in the way they approached the game. You see it more often in the PDL than in other levels I’ve played. And you could see it on the field because we had a lot of success. I learned a lot from coach Eric Bucchere and others, and as far as my experience in the league, I would say the PDL stood out because of the speed of play. In beach soccer, which has a fast pace of play, it’s really important. PDL: Can you talk about how playing with San Francisco Glens has helped develop you as a player and push you to improve? GS: The Glens just finished their first year in the PDL, but I’ve been a coach for their youth club, SF Glens Evolution, for three years. They’re an amazing club as far as community goes. Everyone’s really connected and proud to be a part of the club. You can see it in everything, especially with how my team’s parents and players supported me as a player on the Glens’ PDL team. Also, it offered them a different perspective watching me play rather me being on the sideline coaching them. It was a very good feeling. 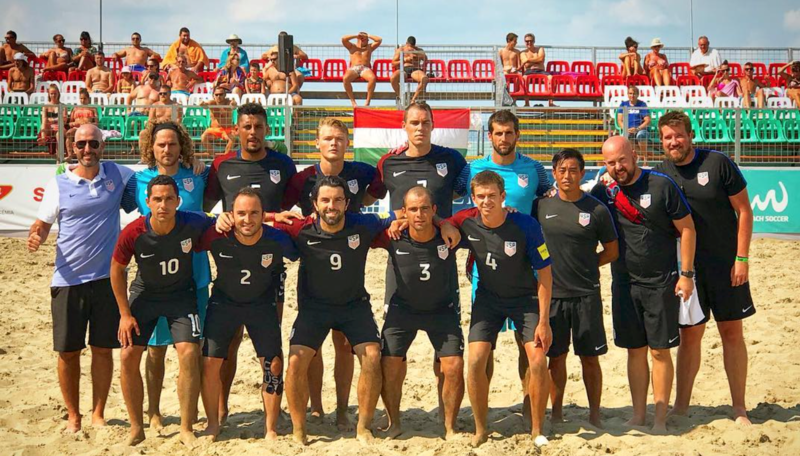 PDL: How did your involvement in beach soccer come about? GS: Tighe Sullivan, my JV high school coach [at Redwood High School], was an assistant coach for the Beach Soccer national team. He was a big influence on me. So was coach Alan Grady and my cousin Anderson, who also went to training camp with the national team. They were really passionate about beach soccer. Anyway, I started playing with them and a few other friends. I’d go out to youth tournaments and then the bigger tournaments years later. I continued to work hard, improve, loved the sport, and now here I am representing my country. PDL: What does it mean to you to be able to represent the United States at the international level for such a competitive event? GS: It’s amazing. It’s something I dreamed of ever since I was a little kid. The opportunity to travel with a great group of guys with a shared passion is the best part, and to represent your country is a dream come true.